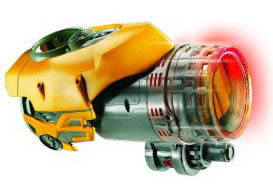 Put on the powerful plasma cannon of Bumblebee and blast the Decepticons into submission. Plasma cannon features music, lights and plasma blast sounds and even converts to robot fist mode so you can defend your Autobot buddies. Features weapon charge-up sounds as well as battle smashing and conversion sounds in robot fist mode.